Yengo Wilderness with the basalt peaks of Mt Yengo (left) and Mt Wareng (right). Yengo, the closest wilderness to Sydney and Newcastle, has the highest plant diversity of all the Blue Mountains World Heritage listed wilderness areas due to its strong north-south rainfall gradient and landscape complexity. 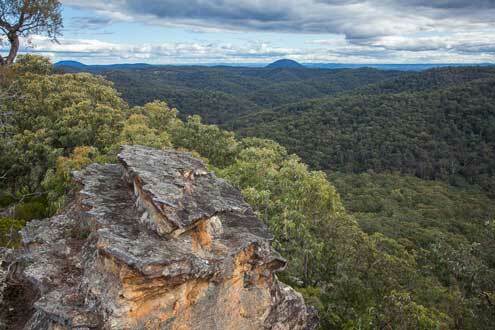 It is a classic sandstone wilderness of interlocking spurs that rises above the Hunter Valley towards a prominent basalt peak – Mount Yengo (668m). Yellow Bloodwoods (Corymbia eximia), one of 43 eucalypt species in the area, are a common sight in the vast open forests of the Yengo Wilderness. The area is also home to 43 eucalypt species, one of which was only discovered in 2005 – a testament to the treasures that can be found in areas like this. Perched sand beds on the Mellong Plateau are another unusual feature on the western side of Yengo. 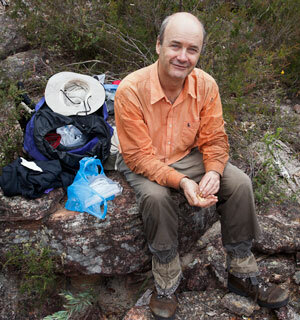 These are a characteristic of monoclines on sandstone plateaus formed when Australia separated from New Zealand and support their own unique vegetation type – the Sydney Sand Flats Dry Sclerophyll Forest. Mr Rees confirmed that four-wheel driving and horse riding would not be permitted in the wilderness, and remarked that the boundaries were established following extensive consultation with park user groups. This meant that popular trails for these interests and all of Parr State Conservation Area were excluded. Wilderness protection followed Mt Yengo being declared as an Aboriginal Place of special significance to Wonnarua, Awabakal, Worimi and Darkinjung traditional owners and their descendants, as well as to contemporary Aboriginal communities. 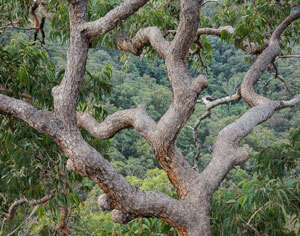 Yengo is a very special place but its protection was complicated. 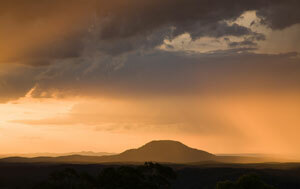 Rainstorm over Mount Yengo, sacred to Aboriginal people across a wide region. 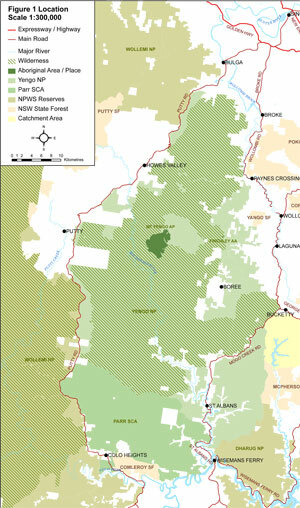 The wilderness declaration was a positive resolution of wilderness controversy compared to the logging disputes that blew up following the creation of Yengo National Park in early March 1988. The incoming Greiner government had promised before its election that there would be no logging or mining of national parks, but transfers for control of logging in Yengo to the NPWS sparked allegations of broken promises. Before logging in the park finally ceased, the National Party leader and Deputy Premier Wal Murray claimed that the park promise may only apply to old parks, and that the reservation status of new parks might be reviewed. While the Yengo logging was resolved in a few months, the inflammatory nature of the controversy set the tone for forest conflict to come, as campaigning settled into a decade of trench warfare with blockades, thousands of arrests, frequent litigation and dramatic, heated parliamentary reviews of court decisions. Looking towards Mount Isobel in the northern part of the Yengo Wilderness. After the forest wars, negotiation for Yengo’s protection was in comparison a breeze, but it happened towards the end of the long wilderness reservation campaign that saw the NSW wilderness estate more than triple in size from 1995 to 2011. 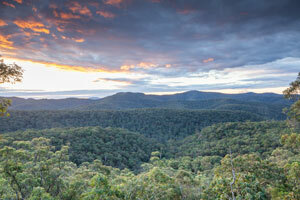 Yengo was consolidated by the purchase of several inholdings using the Dunphy Wilderness Fund. Due to broad public concern about the iconic area, other funds were found for the acquisition of ‘Big Yango’, a 1,582 hectare property which included private lands on Mt Yengo, which forms the focus of this wonderful park. While there were concessions to user groups, the identified wilderness in Simpson Valley of 7,400 ha and Sandy Creek valley to the east of the Big Yango clearing were declared wilderness, as well as the northern part of Mogo Creek valley. Retained were 4WD roads, including the Mt Yengo Loop Track, the Howes Valley and Yango Trails, as well as the Old Convict Road, but this last road remains closed at its eastern end by land owners. Many car camping opportunities are provided at Big Yango – and on the edge of the wilderness at Finchley, Mogo and Heartbreak Hill, among others. These facilities generally follow Myles Dunphy’s original vision, except for the unfortunate 5,000 hectare central wilderness ‘hole’, an historic artefact of negotiations, where 4WD vehicle access is regulated by permit. When visitors step away from their vehicles to embrace this country they will find accessible long ridges covered with remarkable wildflower displays, especially in springtime. The wilderness contains most of the Macdonald River catchment, a recognised but unprotected wild river that flows to the Hawkesbury. Discovering Yengo and Dharug National Park on foot (2001) by Anthony Dunk gives a starting point on walks available, the NPWS website offers further ideas – contact the NPWS on (02) 4320 4200 for vehicle access information.